When revenue managers set prices, they consider their demand, their price and their competitors' prices. Consumers also look at a hotel's price and that of the competitors, but their goal is to assess the value of that purchase, understanding what they will get for the price they pay. Consumers have always had access to firm-generated information besides price like location, amenities and class of service, but with the advent of reviews and ratings, they now have access to user opinions as well. In order for hotels to set profitable pricing and positioning strategies, they need to understand how consumers assess value, specifically, which information they use, and how that information influences their value perceptions and ultimately, purchase behavior. The use of price and non-price information like user generated content (UGC) to make a purchase decision could vary by segment. Business travelers, for example, which represent a significant and valuable source of business for many hotels, could behave very differently than other segments, impacting how managers would price or position the hotel to attract this valuable segment. In this article, we will present the results of a study that investigates how business travelers tradeoff between price and non-price information, and compare that to a previous study in a leisure context. To understand how consumers use price and non-price information like user-generated content, we set up a choice modeling experiment. By tracking choice patterns across subjects, it is possible to understand how consumers trade off among the attributes, and how they value the attribute levels. We told the participants that the location amenities and hotel class were equivalent among the choices, and varied the price (low, medium, high), hotel brand (known versus unknown), the review sentiment (positive, negative), review language (emotional, descriptive), review content (about service or about the room), the aggregate rating (low, medium, high) and the TripAdvisor Rank (low, medium, high). Consumers were asked to select the hotel they would book from among three hotel choices with different mix of key attributes levels as described above. The first set of study participants were given a leisure context. The results of that study are covered in detail in this earlier article, and we will compare these results to the results of our second study on business travelers below. For our study on business traveler choice behavior, we needed to make one key adjustment to our attributes to account for loyalty affiliation, a factor which we suspected was a large influencer on business traveler's decision making. We asked the business traveler study participants to identify their preferred brand from a list of hotel brands that fit with the scenario we presented (i.e. business-friendly hotels located in city centers), and added a third level to the brand attribute from the leisure study, preferred brand. We screened the business traveler study participants to ensure that we were only testing business travelers that traveled six or more times a year and had choice over where they stayed (i.e. did not have to conform to a strict corporate travel policy). Demographically, the majority of the participants were men (66%), and fifty three percent traveled eleven or more times a year. Most of the participants stayed two or more nights on a typical trip (93%), and most read reviews (80%) and were influenced by them (88%). As in the leisure study, the business travelers were asked to pick the hotel they would book from among three choices with varying attribute levels, and they repeated this exercise three times. Digging into the attribute levels reveals some interesting characteristics of the business travelers' booking behavior. The chart below shows the impact on choice of moving between attribute levels. The exact values are less important than the direction and size of the effect, so focus on the color and size of the bars. The red bars represent negative impact. If there is a star by the legend, the attribute level change was significant (i.e. participants "noticed" the change, and it influenced their choice). 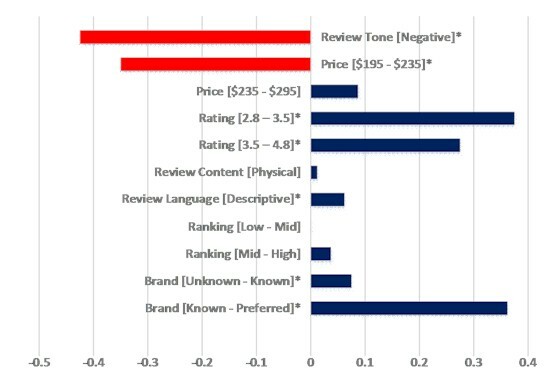 The first red bar is the negative impact of a negative review, which is significant, and quite large. Price, the next set of bars, was only the fourth most important attribute to the business travelers. The red bar represents the negative effect of raising the price from low to a medium price point. It is significant, meaning business travelers noticed the low price, and responded to it. However, the blue bar representing the move from a medium to a high price is not significant. Once the price reached that medium level, business travelers were no longer price-sensitive. The rating effect is also interesting. Remember that ratings were the third most important attribute to business travelers. The first rating bar represents the positive effect of mid-range ratings over low ratings. The second bar represents the positive effect of high ratings over mid-range ratings. While both are significant, the low to mid change has a larger impact on choice than the mid to high change. Business travelers were looking for "OK", and that was more influential than "great". Review content was not a significant contributor to choice, and neither was TripAdvisor Rank. However, review language was significant. Business travelers preferred the more descriptive reviews, over reviews with emotional language. Business travelers wanted to be able to use the reviews to understand the experience, not just whether it was positive or negative. Descriptive reviews helped them to do that, emotional reviews did not. Choice modeling has the advantage of also allowing us to look at the overall value of a set of attributes levels, and track the impact of changing attribute levels on that overall value. Take a look at the first set of equations below. The first equation represents the combination of attribute levels that results in the highest value to the business traveler (in order of importance). Changing one attribute level at a time will show the impact of that attribute on overall value. Notice the impact in the second equation of raising price from low to high. As we mentioned, business travelers do notice a deal, but you can see here that raising the price does not have that much impact on choice behavior. Contrast that with changing review tone to negative. More than half the value is lost. The final two equations show the impact of dropping to an unknown brand and of low versus high ratings. You can see that the impact is about equivalent. Preferred brand is important to our business travelers, but if they see an unknown brand with positive UGC, especially against a preferred with low ratings, for example, they may choose the unknown brand. The effects of attribute levels on overall value described above are especially interesting when compared to the same equations for the leisure travelers. The equations below are from the leisure travel study. The first equation represents the best combination of attribute levels (in order of importance) for the leisure travelers. Price is clearly important to leisure travelers, as raising the price from low to high results in a significant drop in value. But look at what happens when the reviews are negative. The hotel loses all value in the minds of the leisure travelers. They simply won't consider the hotel if the reviews are negative. Reviews matter to business travelers: Business travelers are paying attention to the reviews, both the sentiment and the language of reviews. They will assess the quality of the hotel stay to ensure that it is "good enough" for them. Negative reviews won't necessarily remove a hotel from the choice set, but they must be balanced against a favorable brand, price and ratings. Loyalty membership is key: Business travelers will put up with a hotel that's "good enough" as long as it is in their preferred brand. They are highly influenced by their loyalty affiliation. Business travelers still recognize a deal: Despite their reputation for being price-insensitive, business travelers in this study responded to a low price. They saw no difference at any other price level. This simply means that they recognize a deal, and it would influence their choice behavior somewhat. Hotels that would like to attract business travelers could drop their rates as compared to the market, and likely generate some demand from this segment. However, unless the hotel is at the lowest price point in the competitive set, business travelers are not going to care about a few dollars more or less than the competitors. The bottom line for revenue managers is that pricing isn't getting any easier. Not only do you need to know your price and your competitors' prices to make profitable pricing decisions, but you also need to understand your review sentiment compared to the market. As this study shows, it's also crucially important to understand your customer segment mix as well. Business travelers make purchase decisions very differently to leisure travelers. With leisure travelers it's simple, negative reviews remove you from the choice set, but all else being equal, leisure travelers prefer to pay a lower price. If you are primarily a business hotel, the results of this study indicate that you might have an opportunity to push price in a market, even if you are not at the top of the reputation scale, particularly if you have a significant amount of loyalty members staying at the hotel. Of course, this opportunity goes away to a certain extent if you are at the bottom of the market in reputation. In this case, lowering the price might attract a bit of business traveler demand, where it would not for leisure travelers. If you are an unknown brand competing against the brands with large loyalty programs, you could attract business if your reputation is significantly better, especially if you offer the business travelers a "deal". All of these decisions, of course, are driven by a good understanding of your price position, your reputation position, your business mix, and most importantly, the hotel's business strategy. Breffni Noone is an Associate Professor at the Pennsylvania State University School of Hospitality Management. She holds a Ph.D. from Cornell University. Her research interests include pricing and distribution channel management for services, with particular emphasis on consumer perceptions of, and reactions to, revenue management practices. Her work has appeared in journals such as Journal of Revenue and Pricing Management, Cornell Hospitality Quarterly, Journal of Service Management, Managing Service Quality, International Journal of Hospitality Management, and Journal of Hospitality and Tourism Research. She has also served as a consultant to independent and chain hospitality enterprises in the U.S. and Europe. 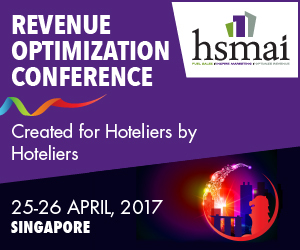 HotelExecutive.com retains the copyright to the articles published in the Hotel Business Review. Articles cannot be republished without prior written consent by HotelExecutive.com.